"I've been mixing tuna with my cottage cheese at lunch for years and I've also enjoyed pairing fresh basil with pineapple. One day, I put it all together and came up with this recipe. Sometimes, I eat it in a bowl, sometimes with crackers, or bread, but anyway it's eaten, it hits all the high notes and is wonderfully satisfying." 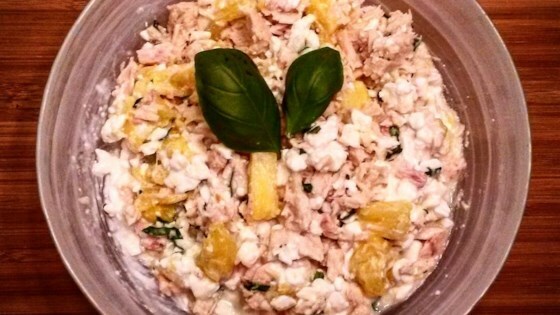 Stir tuna, cottage cheese, pineapple, basil, and salt together in a bowl. Enjoy a light, healthy lunch with this quick and easy tuna salad. Serve alone, on sandwich bread, or with saltines or tortilla chips. For a variation, try adding 1/8 teaspoon cayenne pepper, diced jalapeno, and/or different flavored fruit cups. It was different, and we'd probably enjoy it more with something crunchy added (chopped celery, maybe).